ANTHONY Williamson thought he was doing the right thing by placing speed signs on garbage bins - but he's been asked to remove them. On March 23 the NewsMail reported on Mr Williamson's initiative to help stop speeding drivers along the coastal areas of Bargara, Coral Cove and Innes Park. He forked out thousands of dollars from his own pocket to provide residents with stickers to help spread the message to slow down. Bundaberg Regional Council has now verbally told Mr Williamson to remove the stickers and stop distributing them to residents. This request has left the Realway realestate agent scratching his head. The signs also featured the Realway real estate logo and a photo of Mr Williamson, as well as a contact number. Mr Williamson believes the council isn't looking at the bigger issue. "They've decided to take a look at my signs with a microscope and not about the issue on hand - speeding," he said. 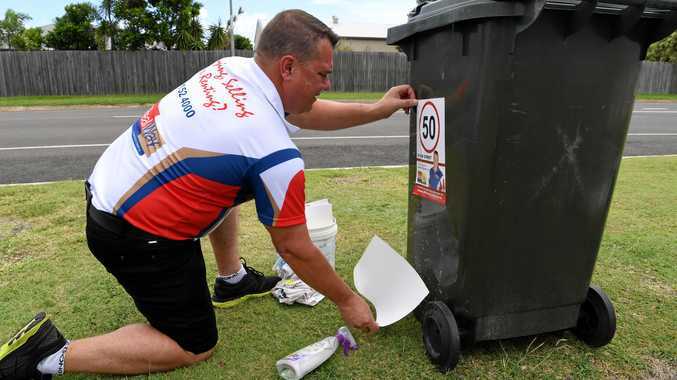 Council waste and recycling spokesman Scott Rowleson said placing stickers on council wheelie bins that displayed commercial or speed advisory information was subject to an approval process. Cr Rowleson said while the council understood the sentiment behind the speed advice stickers but unfortunately they did not adhere to the rules around signage. "Council supports community organised 'Not in My Street' programs through networks such as Neighbourhood Watch and through this process has, at times, approved the placement of speed advice stickers on its wheelie bins," he said. "The approved stickers alert drivers to slow down on our local streets and drive to the designated speed limit." He said legislation required signage to be installed in accordance with the Manual of Uniform Traffic Control Devices , which dictated requirements for the location, appearance, installation and monitoring of bin sticker signage. "In particular, the stickers must be a specific size, have a yellow background, not contain any advertising and only be installed on designated streets, after consultation with residents, council and police," Cr Rowleson said. "Council has worked in close liaison with Neighbourhood Watch groups to ensure the group's needs to highlight traffic speed awareness and a requirement to produce a compliant sticker is achieved. "Importantly, the bins are council property and placement of any material on the receptacles must be approved by council." Cr Rowleson said if any resident or group wanted to place material like Mr Williamson's stickers on bins he urged them to phone the council first. Mr Williamson said he was a law-abiding citizen and would comply with any laws. "While the council is taking time to eradicate my signs they are not looking at the issue of speeding," he said. "I may not have gone to the council in the first place but they didn't come to me to discuss the issue either. "They've just told me to remove the signs. "I was never doing this for the publicity - the whole reason came from a good place and that was to slow people down."